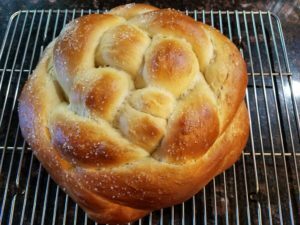 Please join us for a day of challah baking at TEMV on Sunday, October 22! Whether you’ve never made a loaf before, do so weekly, or just want to try a new braid, we’ll have a great time baking together. We’ll guide beginners, swap recipes, and sample our wares. The total time involved can be up to six hours, but only about 45 minutes of that will be hands-on — the rest is rise time. We’ll therefore plan to spend the rise time organizing and shelving books in the TEMV library — but you’re also welcome to go do other errands then as well. Bring a lunch, too—or if enough people are interested, we’ll go out to someplace nearby during one of the rise times. Start time is 9 a.m., but we’ll also prepare some extra dough for those who can only join in later. We’ll supply the basics of flour, eggs, yeast, oil, honey, and salt, as well as some toppings and fillings. If you can also bring your favorite toppings or fillings, please let us know in your RSVP. Toppings could include poppy seeds, sesame seeds, “everything” bagel topping, large-grain salt, or sparkling decorative sugar. Fillings could include raisins, dried cranberries, apples, onions, or cinnamon and sugar. Or surprise us with something else! We could also use some extra cookie sheets, silicone sheet liners or baking paper, large mixing bowls, and measuring cups (the kind that can be leveled off, not the glass ones with a lip). We’ll have some supplies, but having more means less waiting to share. Please RSVP to Dana by October 18 and let us know what you’ll be bringing so we know how much of everything else we need. Thanks!